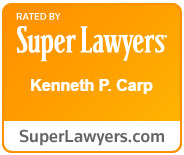 At the Law Office of Kenneth P. Carp, we are well known for our work on behalf of employees in Missouri, Illinois and Kansas. From the initial consultation through any necessary appeals, we provide full-service representation from an attorney with more than 20 years of unemployment law experience. While having an attorney is not a requirement, we understand that unemployment hearings can be intimidating for employees and that the rules governing benefits are often confusing and claims are often denied for what seem like arbitrary reasons. Having the experience of attorney Kenneth Carp on your side can aid you in understanding your rights and presenting a successful case at the hearing. To learn more about the hearing process, see Unemployment Hearings. When you are unemployed and seeking legal counsel for unemployment benefits, the last thing you need to worry about is hidden lawyer or court fees. We offer a set fee for set services, which will allow you to plan and budget. Whether we are aiding you as you focus on applying for unemployment or we are helping you after a claim denial, there will be no hidden fees for you to worry about. To schedule a consultation with our Missouri unemployment attorney for employees, contact ustoday.